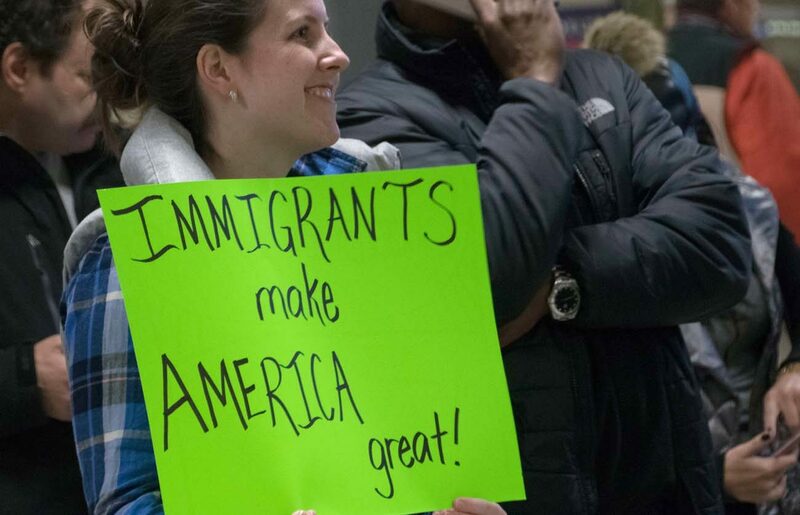 DULLES, Va. (CNS) — While their signs showed their discontent with President Donald Trump’s executive memorandum to halt immigration from seven Middle Eastern countries, the protesters at Dulles International Airport conveyed nothing but welcome for the hundreds of travelers who arrived there Jan. 30. Reports that immigrants were being detained in airports around the country without access to legal representation caused lawyers, translators and supporters to flock to Dulles in the days following the temporary refugee ban. They held “Welcome Home” balloons, handmade signs and cheerfully greeted all travelers as they arrived in the baggage claim area. Though information from Customs and Border Patrol was not readily shared with the protesters, the agency relayed to U.S. Sen. Tim Kaine, D-Virginia, that as of that morning, no one was being detained. Hytham Bakir and JoAnne Kosta came to Dulles, just outside of Washington, because they were hoping to translate for any Arabic speakers. Though their services proved unneeded, as with many others, they stayed to show their support for immigrants. Protesters felt that stopping previously vetted immigrants from coming into the country was unfair and unnecessary, and revealed an animus toward Muslims. Arlington Bishop Michael F. Burbidge, along with many other U.S. Catholic bishops, issued a statement regarding the executive action, saying: “I encourage Catholics to contact our elected officials to make our voices heard: Our communities have been and will continue to be hospitable to refugees, in keeping with our legacy of welcoming the stranger. “Together, we also pray for comprehensive immigration reform and for peace, safety and harmony within our nation and throughout the world,” he said. Late that afternoon, Kaine arrived at Dulles in support of the protesters. In Blacksburg the night before, he met with residents who, through Catholic Charities, welcomed a family of Syrian refugees into their community a year ago. Another Syrian family that has been living in a U.N. refugee camp since 2013 was set to arrive this week.